By definition, as an alpinist, I encounter extremely varied terrain and conditions during my mountain adventures. Having a variety of gear allows me to match my equipment to the climb I'm attempting, so I can achieve maximum efficiency and effectiveness. Sometimes this means buying two of something that seemingly perform the same task, however may have slightly different specifications or purposes. I'm sure many of you acquire multiple sleeping bags, harnesses, and other equipment, with the idea that "a friend could borrow it" if need be. Lately, I have been trying to denounce this idea, and only have multiples of the same item if they truly serve a specific function that I find valuable. This led me to think of the perfect quiver of ice axes, that would serve nearly every climb I would embark on. 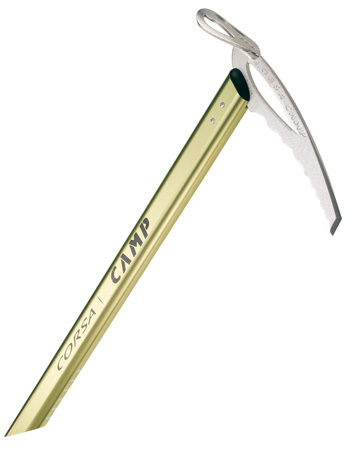 GENERAL MOUNTAINEERING AXE: This ice axe serves as your "everyday axe", and should be sized for comfort. I'm 5' 10" and I prefer this axe to be around 55-60cm, which allows me to chop steps comfortably if need be. It can or cannot have a slight bend in the head, but should have an adze and a positive clearance pick - suitable for self arrest. This axe will serve the purpose of self-arrest tool, anchor, step-chopper, and balance tool, to name a few. It will be ideal for 3-day Baker Climbs or a 21-day Denali West Buttress Expedition. This is your workhorse axe, a classic piolet. ULTRA-LIGHTWEIGHT AXE: This ice axe serves as your skiing, "just in case," and "I'm only going to be on a glacier for 400 feet but still want something for self-arrest," ice axe. It should be short, no longer than 50 cm, and is really for those short glacier jaunts or quick couloir climbs. If you try and chop steps with it for an extended period of time, you'll probably blow out your shoulder or bend the adze. It probably isn't that durable, but it doesn't need to be; the lighter the better is what you are going for here. A great axe for approaching something like the North Ridge of Mt. Stuart, or while doing some extreme skiing in the backcountry. Black Diamond Venoms: The adze has a positive clearance pick and the hammer has a recurve pick. 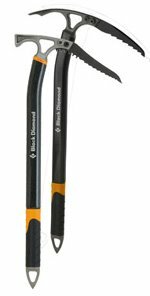 A PAIR OF HYBRID ICE AXES/TOOLS: Are you going to be approaching on a glacier, and then climbing a 50-70 degree alpine ridge? Will there be short sections of steep ice, or will you have to climb moderate rock with your tools? If so, these are an excellent choice which bridge the gap between true ice tools and glacier axes. Having the recurve pick is essential when it comes to feeling secure on steep terrain, however when you strap one tool on your pack and carry the other, the positive curve pick provides confidence in the self arrest position. Sometimes if things get really steep, you can match this tool with an actual ice tool. A pair of these tools will be extremely efficient and comfortable during a climb of the North Ridge of Mt. Baker, or Denali's West Rib. 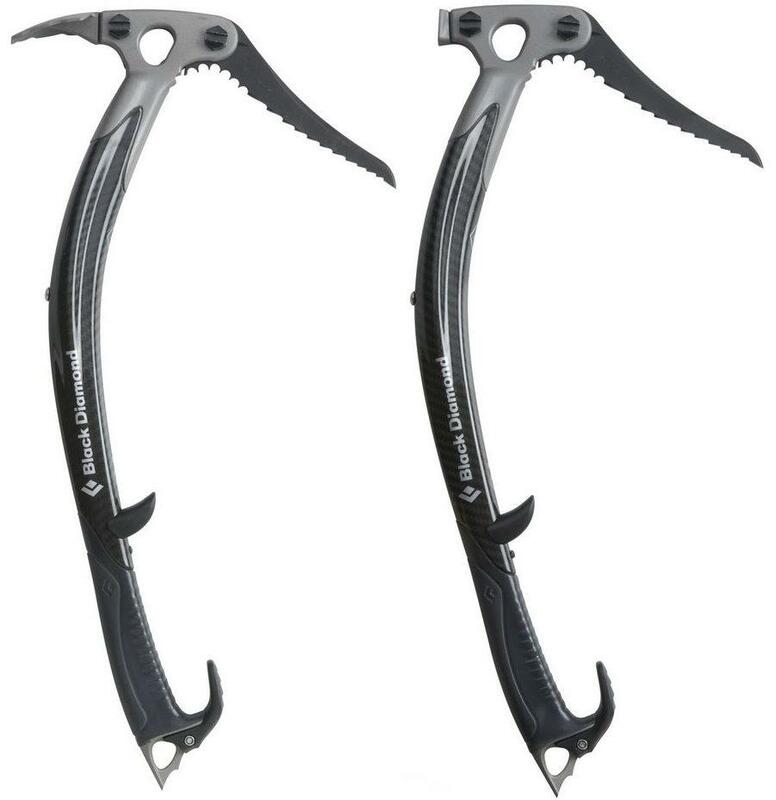 A PAIR OF WATER ICE/DIFFICULT ALPINE TOOLS: These tools are made for steep water ice and challenging mixed alpine lines. If climbing pure water ice, they should have two hammers; if set up for the alpine, one adze and one hammer works well. Having the tools made out of carbon fiber is nice because it does not conduct heat as much, however they are less responsive than aluminum tools. Keep these picks sharp! You'll be using them for the most technical terrain you encounter, like Artesonraju in Peru, and the Ice Park in Ouray, CO. If competition mixed climbing is up your alley then you'll likely need another pair of tools, however for your average alpinist this quiver should serve all their needs. All tallied up, four significantly different types of climbing can be efficiently covered by 6 ice axes/tools total. You can obviously mix and match if needed, and personal preference/ability could easily add or subtract tools from this list. I would love to hear what your perfect quiver of ice tools looks like, and what you actually currently have. Please leave us comments!